Clun Forest Sheep are a very adaptable breed, living equally happily in the down lands of the South of England or the hills of Wales and Scotland. They have a low mortality rate and are highly resistant to disease. They have an alert appearance with a clean open dark-brown face, with a characteristic covering of wool on the top of the head and ears that are carried high and forward. The body has a strong muscular neck carried high from fine shoulders, lengthy good back, deep rib, strong loin, good hock and a deep and well-rounded rear. Clun ewes are protective and productive mothers. Longevity is a strong point of this breed. 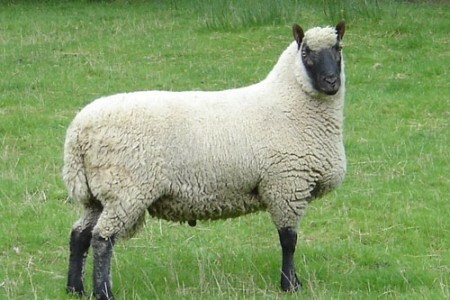 The Clun ewes are used for either the production of cross bred ewes. Pure Clun lambs are highly prized for their meat which is lean, dark and full of flavor. The fleece is generally of a high quality and is very popular in the production of knitting wools and felts.